Holy #$%@ Those BPYO Kids Are Good! Probably the first reaction anyone has to hearing a performance by the Boston Philharmonic Youth Orchestra is something like “Holy #$%@ those kids are good!” So we’ll just get that bit out of the way and treat their Sunday presentation at Sanders Theater, under Benjamin Zander’s baton, as we would any other professional-level concert. Ravel originally conceived the infectious opener, his ever so elliptical La Valse, as a ballet in the first decade of the 20th century; a hat tip to the glamor and glitz of fin de siècle Vienna, it became, by the time it was completed in 1920, both a rueful and savage reflection on what that society had inflicted on European civilization, whether through negligence (the “sleepwalker” theory) or arrogance. Zander’s conception seemed to want to split the difference, embracing Ravel’s coloristic flourishes while holding back his full wrathful roar until the very last second; we would have appreciated a more teleological shaping of the entire work. The tempos seemed just right and the phrasing (including judicious rubatos) gave full value to the rolling effect of the obsessive ¾ meter (remembering that “Walzer” comes from the word “to roll”). There was superb precision playing by solos and sections; among the many contributors we can acknowledge piccolo Olivia Iverson, trumpet Elmer Churampi, and the entire percussion section. 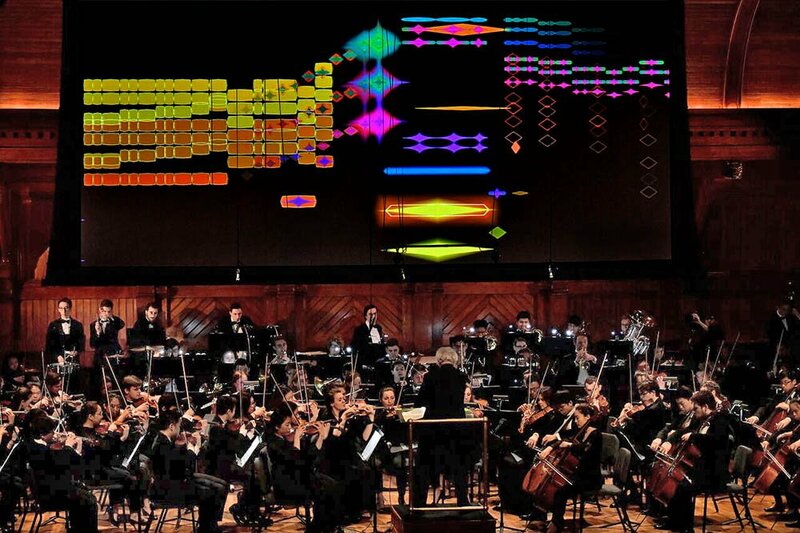 Zander essayed an experiment with the Ravel, by conjointly projecting an abstract computer-generated representation of the music, in a system devised to facilitate teaching about music to those who know little about its workings, forms and notation. Although the geometric symbols on the screen were color-coded to distinguish their timbres, this was not an exercise in Scriabinesque synesthesia; in its way it was more akin to shape-note singing. Zander advised the audience that watching the screen was entirely optional, as probably most of the Cambridge audience (the concert was live-streamed, so the total audience was much greater) had no need of the instruction. We don’t wish to speculate on the pedagogic value of this exercise (comment from those who know about these things is welcome), but we do know that the lowered screen couldn’t help but muffle the sound of the percussion and brass sections. The program’s forepart concluded with a most intriguing performance of Elgar’s ever-popular (is it even more popular now than Dvořák’s?) Cello Concerto in E Minor, op. 84, with the estimable Zuill Bailey as soloist. Bailey, an artist of formidable accomplishments and waxing renown, has been curiously scarce in Boston-area halls. 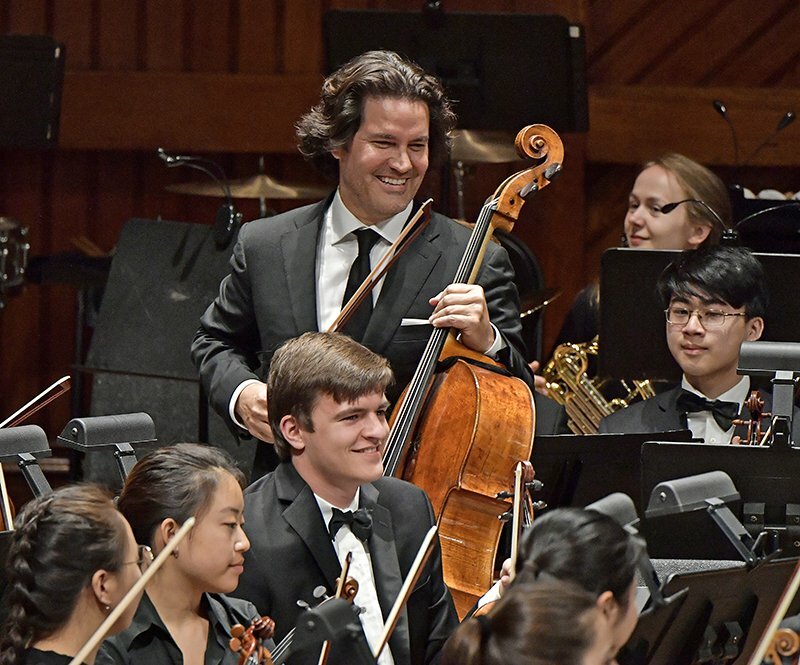 BMInt’s archives disclose only a handful of chamber performances, mostly during summers in outlying regions, and just one prior orchestral appearance, with BPYO’s “parent” organization, the Boston Philharmonic. Prior experience had informed us that neither Bailey nor Zander possesses what you would call a retiring musical personality, and we expected that their collaboration would seek to challenge the searing intensity and over-the-top showmanship of Jacqueline du Pré’s iconic performances. Of intensity there was no shortage, but it was the inner-directed sort one associates with, say, the Schumann concerto. This is no bad thing: the Elgar is a work of loss and mourning. Like the Ravel, with which it was contemporaneous, and like the chamber music (especially the Piano Quintet) he wrote then, it stands agape at the wreckage of Europe; but at the same time it also reflects his sense of having become a musical fossil in his own lifetime. So, despite flashes of power, Bailey approached the concerto, for the most part, with dignity and forbearance, his Goffriller supplying a singing but not overripe radiance. There were moments of pure musicianly satisfaction, as well: in the second-movement scherzo ZB and BZ exchanged smiles at several well-coordinated turns of rubato. Zander, for his part, was deferential in his accompaniment (having kept the full orchestral complement—some 126 of them—in place for this relatively lightly scored piece, he held them firmly in check), but was subtly effective in dynamic shaping and phrasing. The second half began with another bit of experimentation, a performance of the first of Charles Ives’s Two Contemplations, the ever-astonishing The Unanswered Question. Dating from 1908, it has with perfect accuracy been described as “music without precedent,” and “40 years ahead of its time.” It has become Ives’s calling-card, and for a description, you can turn here. One amendment to that description we’d offer is that the last note of the “question” alternates between B and C, and is always coordinated to be dissonant to the chord the strings are then playing, except on the final iteration, where it blends into the string background. The performance Sunday placed the strings in the hallway behind the hall, the trumpet (Churampi) in the balcony, and the flutes (Carlos Aguilar, Jessica Shand, Stella Brooks, and Iverson) onstage, creating just the lovely spatial effect Ives had in mind, and the performance was incandescent. It was prepared and conducted by eminent NEC professor and Ives scholar John Heiss, for reasons Zander eloquently explained, to do with the recent death of Heiss’s son. In such matters, the questions a parent asks remain ever unanswered. The official closer, Richard Strauss’s Till Eulenspiegels lustige Streiche, op. 28 (1894), probably the most popular of his tone poems, is cast, as are its siblings, in respectable classical form (rondo), though stretched nearly to the breaking point. Too familiar to warrant extended description, it’s enough to note Zander’s fairly relaxed tempos and consequent attention to details of balance, phrasing and color, especially color. 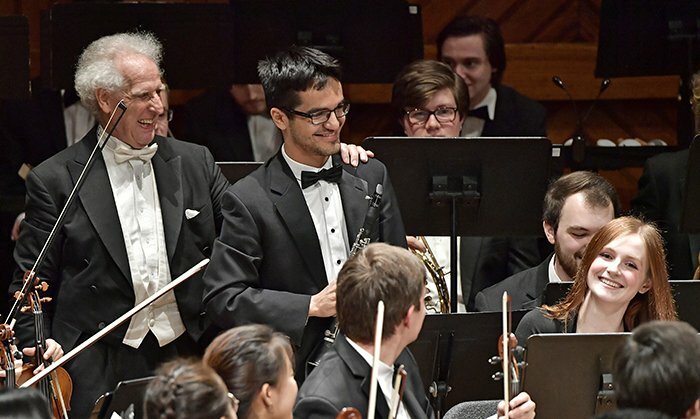 The colorful pranks served to spotlight the skills of soloists and sections within the orchestra, and bringing them together in the massed sonorities, Zander uncorked the full potential of these talented players. The principal themes assigned to the character of Till, one the jaunty and mock-heroic one in the horn (Joseph Cradler), the other the mischievous sniggering one in the E-flat (originally the now-obsolete D) clarinet (Zander asked its player, Diego Bacigalupe, to hold it up, and said “this is the nastiest instrument in the orchestra,” and everyone who has ever played it silently nodded assent), brought forth impeccable execution. The numerous call-outs to players and sections at the end were all richly deserved. This having been the last BPYO performance of the regular season, Zander took time for some valedictory duties, including a farewell to the orchestra’s 19-year-old concertmaster Mitsuru Yonezaki (Zander used the ungendered British term “leader,” which caused a rustle of confusion among people who thought he was announcing his own retirement), who has apparently been with the orchestra for nine years. He then led the traditional, radiant reading of the “Nimrod” variation from Elgar’s Enigma Variations to cap the season. While these columns don’t exist to fundraise for performing organizations, we are pleased to reference the 2018 European Tour Kickstarter campaign [HERE]. Comments Off on Holy #$%@ Those BPYO Kids Are Good!